On Friday, October 7th, Galerie m Bochum will open the exhibition Himmelsleiter featuring works from a documentary painting project by Caroline von Grone (*1963, Hanover). From four perspectives and in three formats Caroline von Grone has documented the play of light across the facades of a worker’s housing estate. The profane subject matter offers a foil for color-intense painting. 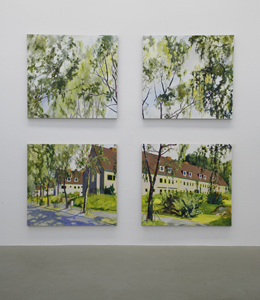 The artist has occupied herself with this estate since 2008, painting it in various lighting conditions and seasons, and plans to continue to focus on these houses in the future as well. Behind the show’s poetic title is the name of a widows’ housing estate built in 1948 in Kiel, which is slated for imminent demolition to make way for a profitable new housing development. Four long row houses are lined up parallel to an escarpment with a stairway leading up that is known as the “Himmelsleiter” (which can be translated as “Jacob’s Ladder” or also “Stairway to Heaven”). The unadorned and pragmatic buildings appear on the panel pictures at times as a graduated row complete with their surroundings, and at other times as archetypal house front: a square topped by a triangular pointed roof. 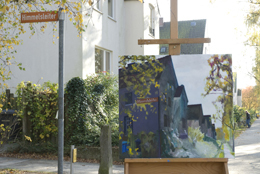 Knowing that the houses, which are located close to Caroline von Grone’s former studio, are soon to be replaced by a large construction site inspired the artist to embark on her impressionistic color-play. Von Grone works in the tradition of plein air painting, trying to capture on canvas the mood of a specific place at a given time and the singular atmosphere of the light. The expressive power of paint remains palpable in the picture, even when the artist remains true to the appearance of her subject. Included in the exhibition are small-format sketches and mid-format color studies Von Grone prepares for her paintings, attesting to the process involved in her working method. The quick sketches, where the element of color often does not yet come into play, set down the composition, while the mid-format canvases are color studies that approximate the atmosphere created by the light and the seasons. Sometimes the trees are leafy and green and cast dark shadows across the facades, and at other times Caroline von Grone’s paintings show the bare branches of winter. br> The large-format, multi-part picture panels manifest the housing estate’s timeless architecture and serve as memorial to their motif. Namely, like many of the workers’ estates built in the postwar years, the social utopia of the Kiel Himmelsleiter development has also run its course and the old houses will soon be replaced by brand new apartments. 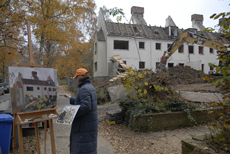 In a second part of the series, Caroline von Grone has now accompanied the step-by-step demolation of the estate with her painitings, thus closing the cycle of this relic of the postwar period. The paintings are now on view at Galerie m. The gloomy atmosphere of the empty houses increases now that they are already broken down to some extend. Caroline von Grone pictures the process of the houses slowly fading away, which is not only caused by the demolation but also by nature and graffitti that cover the walls and windows. 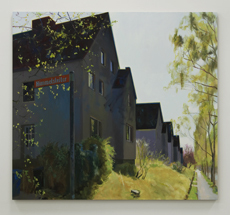 In a series of paintings Caroline von Grone deals with the window as an interesting motif in this context: While the walls and windows bear traces of damage, the reflections of the window show the still intact houses on the opposite side of the road.